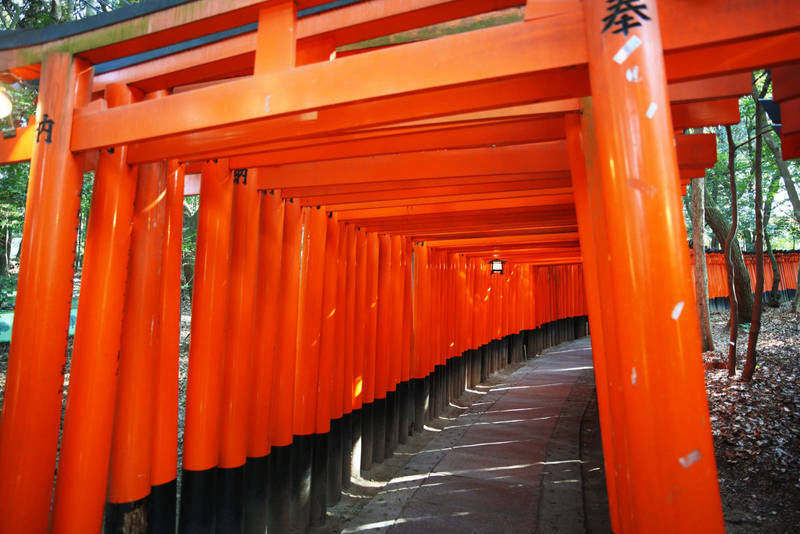 The Fushimi Inari is the most important kami Inari-dedicated Shinto shrine in the country, one of the most famous Shinto shrines of Kyoto and one of the most visited places. It is located about 5 km south of Kyoto station, surrounded by a hill that reaches a peak height of 233 meters, and where there are several very popular paths. 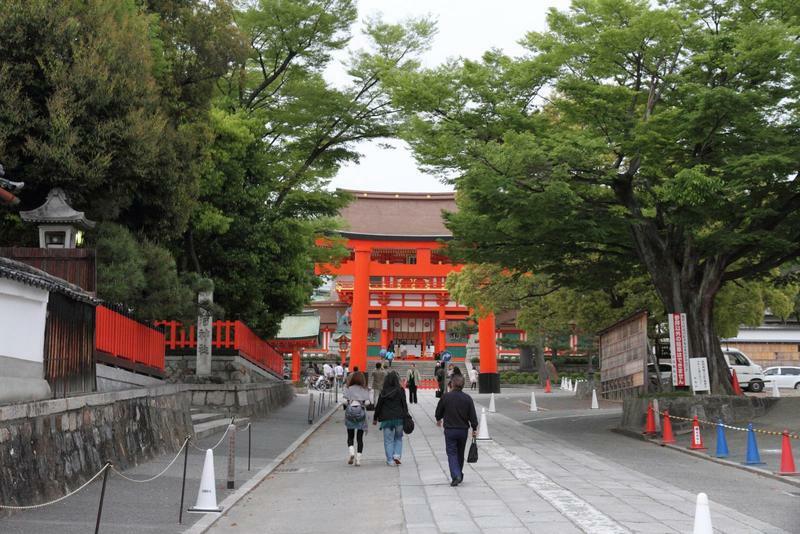 The main attraction of this place is not so much the shrine itself, whose main buildings are located at the base of the hill and however are worth a brief visit, but above all the trails ("tunnels") under hundreds of torii (sacred Shinto gates) that make the walk very special. 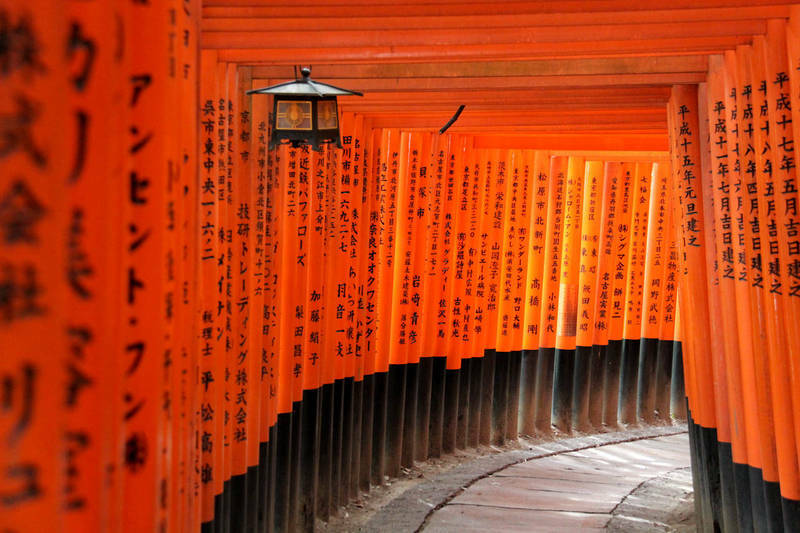 Each of these torii has been donated by someone, in fact, on the back of each of them you can find writings indicating the name and the date of donation. It takes at least two hours to reach the top of the hill, to which you have to add the time to go back. 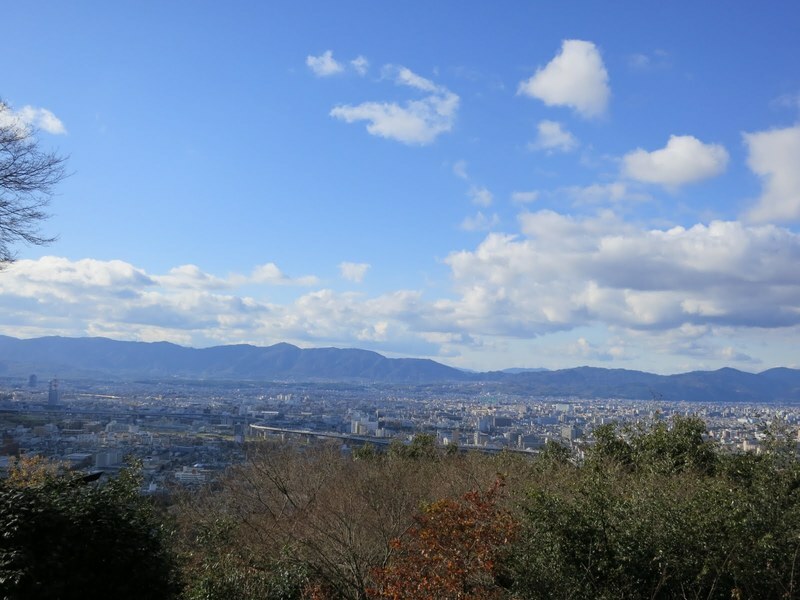 The majority of people don't reach the end of the trails, but stops at the Yotsutsuji intersection (or even earlier), a place that is located around half way up, from where you can enjoy a panoramic view of a part of the city of Kyoto. 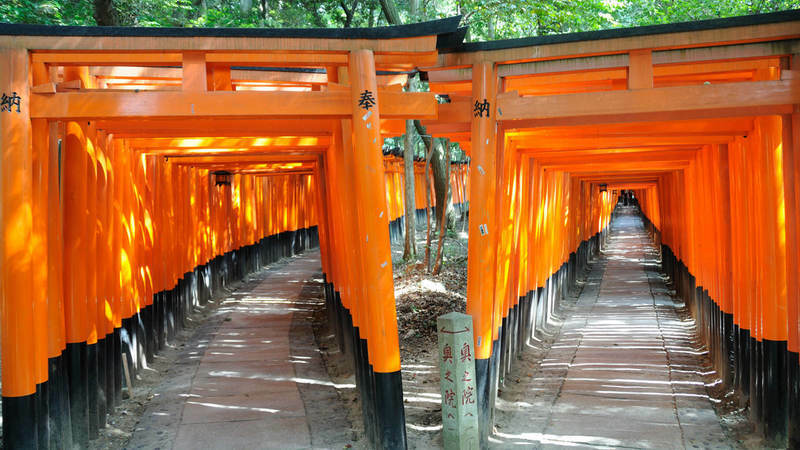 From then on, the torii begin to decrease and the path becomes a little steeper. Along the way, you can find some tea house, restaurants, and small Shinto buildings belonging to the temple. 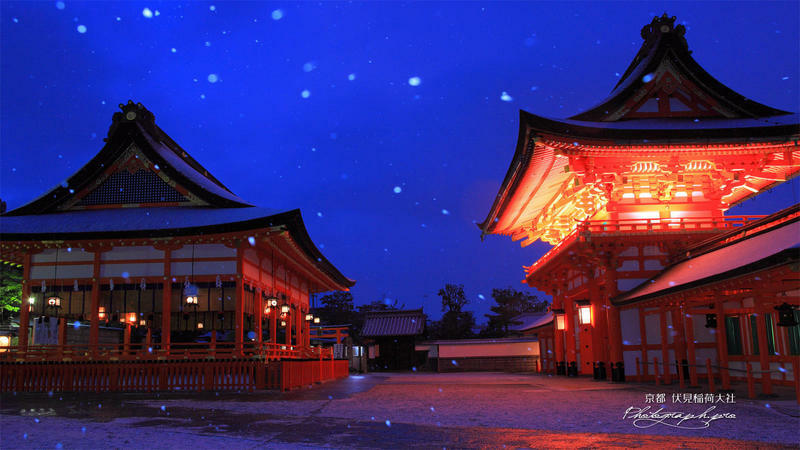 You can also take the path after dark as there are lanterns to light the way. It isn't an area where I recommend to stay, because of the low supply of hotel and the position, it is too isolated from the rest of the city. As I previously wrote, along the route to go up the hill of Fushimi Inari can find some small restaurants and stalls selling various japanese foods and snacks, for example the inarizushi, sheets of fried tofu stuffed with rice, which according to tradition were a favourite food for the foxes, a sacred animal which often represents the kami Inari, the deity to whom the shrine is dedicated. At the Yotsutsuji intersection you can also find a tea-house. Inari station, served by the JR Nara line, you can reach it from Kyoto station in 5 minutes (140 YEN). Pay attetion: only the "Local trains" of the Nara line stop at Inari station. Fushimi Inari station, served by the Keihan Main Line, a line that is almost useless for a turist, maybe just if you come from Osaka, anyway, in 99.9% of cases, the best solution is the JR Nara line.